Favorite city to ride a bike in in the world: I love biking in SF, even the downtown areas aren't intimidating. I love how in Chicago you can go for miles without hitting a hill, but the downtown areas are much more intimidating to me (probably because I don't bike on them much). Helmet or no helmet: I try to be a good example. Type of bike: older, beautiful panasonic road bike or shiny new pake with basket and a back rack. Describe what you like best about your bike: my road bike has this amazing paint job - it's purple but with a sort of misty pink on the top bar and fading out down the frame. One side of the handlebars have the Canadian flag as bar tape, the other is Swiss. Tell me about Bike Basket Pies: I bake little pies using local and organic produce and deliver them by bike in San Francisco. I'm based in the Mission and deliver mostly in SOMA and the FiDi. I use farmer's market, homegrown, and foraged ingredients when I can. 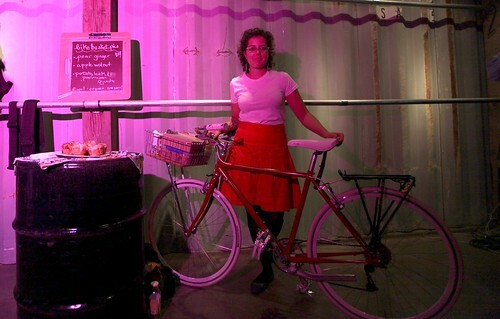 What's the link between bikes and food: Sometimes I feel like I'm hauling fuel for biking. Favorite time and/or place to ride: around 10 or 11 am downtown. The traffic is light, there aren't as many bikes - it's still busy, but downtown feels almost empty compared to how it is around the commuting hours. Alternatively, late at night. Describe your personal style: I wear what I like - a lot of t-shirts, skirts or shorts with tights, plaid, a mixture of handmedown, thrift, sale, found, and t-shirts basically. Vélo Vogue tip of the day: don't buy clothes you can't ride a bike in. alternatively, don't be afraid to ride a bike in whatever it is you're wearing.